RANGERS boss Stuart McCall says he is already working on a dossier of signing targets for next season - even though he may not be around to parade them. The interim Ibrox manager still does not know if he will be in charge beyond the current campaign after being lured back to his old club to kick-start their faltering promotion bid. So far, everything is going to plan with Gers second in the Scottish Championship table and destined for a semi-final play-off slot. But with 12 players out of contract, McCall knows the Light Blues will need to strengthen if they have any chance of keeping pace with rivals Celtic next season - if they go up - and is already piecing together a wish list of potential new arrivals. He said: “I’ve been speaking to a lot of agents and putting things in place for if and when... Even if I’m not here, if I’m getting players put to me who would like to come to Rangers regardless of the manager, then we build a little portfolio of positions that we will be needing next year. “It’s not a case of us standing still and then thinking come June 1, ‘Oh we need to get into action’. “No, there are a lot of agents who come to us and we build a little dossier of players that as a staff, we think will be good for next season, regardless of what league we are in. Rangers have operated a haphazard transfer policy since re-emerging from the embers of liquidation. The club’s team of scouts were jettisoned under the disastrous Craig Whyte regime and former boss Ally McCoist was largely forced to turn to a list of former Ibrox servants he had personal knowledge of when trying to bolster his squad. But McCall revealed the club’s new board are now starting the process of re-establishing their spying network - albeit on a smaller level than before. 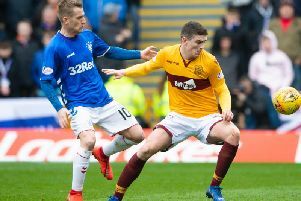 “I think there has been discussions behind the scenes with different people,” said the former Motherwell boss. “I don’t think we are at the stage where we were 10 or 15 years ago where we were aiming to get into the Champions League and bringing players in for three and four million yet. “I don’t think Rangers will be at the stage yet next year where we need international scouts everywhere. “But certainly a scouting network needs to be put in place. “Having said that, I spoke to Craig Levein at Hearts and they do a lot of their scouting with [online service] Wyscout. When I brought Henrik Ojamaa in at Motherwell, that was after I’d seen a clip of him on YouTube. I sold him for £350,000 after signing him for nothing. That was great. “So you can still do your own background work. Personally I would always like to see the player myself. I’ve only ever signed one player without watching him first and slightly regretted it. McCall admitted he still does not know if he will rejoin Gordon Strachan’s Scotland staff for the June 13 Euro 2016 qualifier with Ireland in Dublin. And he also confessed to uncertainties ahead of Saturday’s match with Falkirk. Peter Houston’s Bairns - five points behind fourth-placed Queen of the South with two games to play - need an unlikely series of results to make the play-offs but McCall says that raises more questions than answers. He said: “Housty is a wily old fox who has done terrifically well in his career so I don’t know what to expect. “It will take a difficult set of results for them to get into the play-offs so I don’t know if they will come here and think the pressure is off and play care free.